Do you like this review? I’ve got many others on the Reviews page! Photoshop is great! Don’t be scared of it – trust me! You can order Photoshop (PC or Mac) from the Adobe website – that’s where I got it! And, even better, you can download right from there, so you don’t have to leave the comfort of your slanket! I have been using this for many years and it is absolutely indispensable in my workflow. I have a FREE HDR Tutorial for Mac or HDR Tutorial for Windows here on StuckInCustoms.com that describes the step by step process. 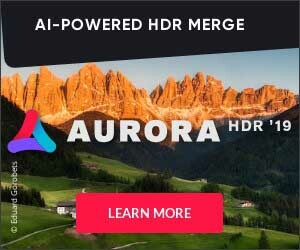 If you’d like to dive deeper, I also have video tutorials for Aurora HDR on a Mac and a separate one for using Photomatix Pro on Windows. Both tutorials show how I use the tools for a variety of situations… landscapes, sunrise/sunset, people, motion, etc. You can start using Photoshop effectively in the first 15 minutes! For my HDR Tutorial, I really only need you to understand a few simple things like layers and masking. Photoshop has about 10 million OTHER things you can do too, and you will learn those over time. But, do not make the mistake that you have to understand everything in Photoshop to be able to use it. Believe me, I work with many Photoshop experts that still don’t know everything! Yes, you can use the vastly scaled down and cheaper Photoshop Elements (click to order from Adobe – PC or Mac). Now, Photoshop Elements still has layers and stuff, but I do not recommend it because it does not allow all the other plugins that I like to use. For example, if you check the Reviews section of the site, you will see I recommend many other plugins – and these won’t work with Elements. I think that you should be prepared for the future. Get started first just the regular Photoshop, and then later you can get the plugins and stuff. Do you use other Adobe products? Yes! I also use Adobe Lightroom to organize all my photos. It is a fantastic product, and I recommend it over using the default File Manager on your computer. Look, Photoshop basically has no competition. They own the market, and that is for good reason. There indeed “free” alternatives out there, but I don’t think they have the expandability and pluggability of Photoshop. I use it — and if it is good enough for me, I hope it is good enough for you. I figure you know that I demand the best, and Photoshop falls squarely into that category! I hope you enjoyed the Photoshop Review – let me know if you would like to know more information!